The FilterLogic compatible for the Maytag UKF8001AXX offers the same if not better levels of filtration as the original. The high quality carbon block effectively removes up to 99% of chlorine to improve the taste and odour of your water. Cartridge life is approximately six months depending on usage. This compatible water filter fits models with a long cylinder 'drop down' compartment in the top, right hand side of the fridge. Spent water filter cartridges are removed with a twist and a gentle pull. An automatic shut-off minimises leaks to keep it clean and simple. To install new cartridge, push it into position and twist. The Wpro external in-line water filter is compatible with Samsung (DA29-10105J, WSF100 and EF9603 models), GE (GXRTQR, QXITQR and QXITQ models), LG (BL9808 and BL9303 models, Liebherr SBS7052-4 and Whirlpool appliances, where the water filter is fitted externally. The water filter has push fit fittings that take a 1/4" pipe and provides the very best quality water from a very compact cartridge. 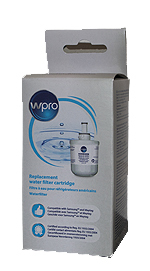 It is recommended that the Wpro water filter cartridge be replaced every 6 months or 5,670 litres. RSA1DTMH, RSA1ZTWP, RSH1DE1S, RSH1GFE1S, RSH1FERS, RSH1FTMH, RSH1FTSW, RSH1DTMH, RS55XDPSW, RS55XDGNS, RS21DCSW, RS21DCNS, Series SS20, SS22, SRS & SRS24. Maytag SBS quarter turn casinetta clean ice and water filter - This Maytag water filter fits all Maytag and Admiral fridge freezers manufactured with the water filter located in the base grille under the freezer door. Genuine Maytag product. Twist fit to remove and replace. It is recommended that the Maytag water filter be replaced at least every 6 months or 1500 litres. The manufacturers have upgraded and repackaged the UKF8001, which we now have in stock. Maytag water filter UKF8001/1, newly designed (also known as the PuriClean II) water filter fits models with a long cylinder 'drop down' compartment in the top, right hand side of the fridge. Spent water filter cartridges are removed with a twist and a gentle pull. An automatic shut-off minimises leaks to keep it clean and simple. To install new cartridge, push it into position and twist. Replace this Maytag water filter every 6 months or when system light indicates. The APP100/1 Wpro water filter adaptable for the Samsung Aqua-Pure water filter has a new 'key' inside and it is manufactured to fit all Samsung refrigerator models already on the market and all new models after March 2009. Wpro water filter code 4840 0000 0513. DA29-00003G, DA29-00003, DA29-00003A, DA29-00003B, DA29-00003A-B, HAFIN2/EXP, DA97-06317A, TADA29-00003A, TADA29-00003B, DA61-00159, DA61-00159A, DA61-00159A-B. 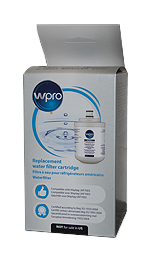 The Wpro 4840 0000 0513 water filter is designed for all Samsung refrigerators with built in filters. The water filter should be replaced every 6 months or if you notice a decrease in flow of water. For models with a filter indicator light, change the water filter when the light turns red, every 6 months or if you notice a decrease in flow of water. When the filter is replaced, reset the indicator by pressing the Ice Type button and the Child Lock (or Moisture Control) button simultaneously for 3 seconds. For a non-scratch, streak-free finish, Hillmark SteelKleen Stainless Steel Pump Spray is perfect for use on appliances including fridges, ovens, microwaves, toasters, kettles, dishwashers, rangehoods and splashbacks. SteelKleen is a unique formulation that that removes fingerprints, smears, spatters and waterspots and leaves a transparent film that actually repels new marks. No more fingerprints! SteelKleen provides a streak free finish and will keep your appliances looking as good as new. This means that from the first time you use SteelKleen you spend less time cleaning! LG LT500P Fridge water filter is designed to fit the newer LG refrigerators which have internally fitting cartridges (fitted within the refrigerator compartment). It is also used in some Smeg and ATAG US style refrigerators (the KA211 series). The filter is designed to last six months or 500 gallons - whichever comes first. Replaces: LT500P, 5231JA2002A, 5231JA2002A-S, ADQ72910901, GEN11042FR08 Smeg and the KA211 by ATAG. 484000000626. What does this water filter remove? The Whirlpool SBS 1/4 turn water filter replaces the 481281729632, or SBS002, fits all Whirlpool fridges with the water filter cartridge located in the grille at the base of the fridge freezer. It is recommended that the water filter cartridge be replaced every 6 months. Do you need a Microban Antibacterial Air Filter too? To find out more, click here. Maytag water filter UKF7003 (UKF7003AXX) water filter provides the highest quality water and ice for you and your family right from the refrigerator door by reducing lead, cysts, chlorine, off tastes, unpleasant odours and sediment. Refrigerators with a Water Filter Change Indicator on the Dispenser Control Panel, when the Water Filter Change Indicator illuminates. The Maytag UKF7003 (UKF7003AXX) water filter fits Maytag & Jenn-Air refrigerators with a round, screw-in filter located inside the refrigerator compartment above the top shelf. Jenn-Air refrigerators are made by Maytag. Based in Surrey, UK. Fridge Filters Online are experienced providers of Maytag Water Filters, Amana Water Filters, Admiral Water Filters, Fridge Water Filters, Fridge Filters, Water Filters For Fridges, all well known brands. Maytag, Amana, Admiral, Whirlpool, GE, Wpro, Omnipure, Samsung, LG, Liebherr, Affresh.